Surface Pro 2 to sport Haswell, two-move kickstand and 8GB of RAM? Will the new Surface Pro and old be twinsies? Microsoft's Surface Pro 2, the follow-up to its Windows 8-powered tablet, is nearly ready for its close up. That's according to sources speaking with The Verge, indicating the next-gen Surface's design is finalized and Microsoft intends to get it to consumers by year's end. There won't be drastic differences between the Pro 2 and original Surface Pro, the sources said, but Microsoft should throw in an adjustable kickstand with the slate. However, "adjustable" doesn't mean contortionist flexible, as there will only be a traditional "laptop" mode and a new (exciting!) angle for use on uneven surfaces. We place our tablets on craggy rocks all the time, so we're especially looking forward to this feature. Two other spec spits indicate a flavor with 8GB of RAM will ship and the tablet will embed Haswell in its belly. Armed with the new Intel chip, the tablet will have better battery life, though only about two hours more, according to The Verge's birds. Neowin reported to The Verge that the Surface Pro 2 will indeed have a Haswell-based Core i5 chip from Intel, and the RAM will jump from 4GB to 8GB. The site also mentioned a "refined" kickstand, though an absence of other external differences between the two generations. Neowin wasn't informed of what the kickstand changes entailed. Paul Thurrott at Windows Supersite corroborated much of Neowin's report (and The Verge backed up Thurrott's), noting the Pro 2 will look exactly like the Pro we have now and will offer more than one RAM choice, not just an 8GB boost across the board. Lastly, there's general consensus the Surface RT 2 will indeed drop the "RT," as we reported earlier. 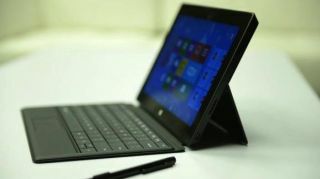 The Surface 2 will also reportedly feature an adjustable kickstand and sport Tegra 4 silicon. Both it and the Surface Pro 2 are said to be replacements for the current models. Microsoft buys Nokia's handset division, but can Nokia teach its new boss a thing or two?